I learned yesterday of the passing this past Tuesday of Geoff Emerick, who engineered the Beatles’s catalog from Revolver onward. If the name does not ring any bells that is not entirely accidental: producer George Martin was fiercely territorial of his relationship with the Beatles in the recording studio and did not want others getting credit for what he saw as his domain. Emerick complained justifiably in his memoir Here, There, and Everywhere of him and others being minimized cavalierly as merely “the staff” despite their important contributions. Martin’s accomplishments were of course significant but one can state with strong accuracy that had Emerick not been there in the Abbey Road studios that Revolver and Sgt. Pepper in particular would not have been the albums that we have now been listening to for half a century. Emerick worked in a supportive role on Beatle recordings from virtually the outset in 1962 and became their chief engineer in April 1966 when Norman Smith left to produce Pink Floyd. The first song Emerick engineered was “Tomorrow Never Knows.” He was all of twenty years old. The Beatles went on the road that summer for what would be their final tour. When they regrouped in London later that year they began the Pepper sessions, beginning with the double-A side single of “Strawberry Fields Forever” and “Penny Lane.” The pressure was truly on Geoff Emerick at this time because the Beatles had made clear to him that they would no longer be touring and that the studio releases were the band’s authoritative communications. It was his job to take their ideas and and find a way to get them on tape. That was no small task in the days before digitization. It was a seminal year in British history; 1966 came fifty years after the battles of the Verdun and the Somme, nearly twenty years after V-E Day, and a decade after Suez. England defeated West Germany in the Word Cup that summer. Austerity Britain was giving way to Swinging London. Drab greys were giving way to the technicolor uniforms the Beatles would wear in 1967, the style inspired by the nostalgia for neo-militaria that was common in Britain in those years immediately after the Empire’s collapse. So much of that seems dated and overdone today, a relic of a time gone by. I suppose none of that really matters anyway. All that is left of true importance is the magic of what happened in those studios, in which Geoff Emerick played such an important part. I was teaching a class this past semester in which the topic was the style wear of pop musicians of the 1960s and 1970s. (The course was on the business of the fashion industry.) Students had been tasked to find an iconic image of this or that pop star and discuss the hows and whys of the style of dress. I urged one student to analyze Elton John’s Savile Row bespoke white suit, for instance. Anyways I began the bibliographic instruction session with a discussion of the psychedelic military-inspired suits the Beatles wore on the cover of Sgt. Pepper’s Lonely Hearts Club Band. The words were just out of my mouth when a student scoffed at my saying the Sgt. Pepper is probably the most culturally significant rock album ever made. Not necessarily the best rock album ever made–it might not even the best Beatles album ever made–but the most culturally significant, I averred. I was taken aback briefly until it dawned on me that said student, flush with the confidence of youth, probably had no concept of what Sgt. Pepper represented when it was released. Born in the mid to late 1990s, the student literally might not have known who the Beatles were. Rock music itself is no longer the cultural signifier it once was; rap and hop hop surpassed it a long time ago. Even the “record album” itself is passé; iTunes, Spotify, etc. are where today’s youth get their music. The album itself is no longer the unit of currency. I am not a Luddite but I would argue we have lost something in that, in particular the shared experience that a Sgt. Pepper represented to a cohort. Sgt. Pepper has been going in and out of style of half a century now and paradoxically feels dated and relevant at the same time. It’s playing quietly in the background while I have my coffee and type these words. In that class a few months back I was trying to explain to the students how the muted greys of Austerity Britain were giving way in the tangerine brightness of mid-1960s Swinging London. Britain’s baby boomers were looking to their past, especially to the styles of pre-Great War Edwardian England, for inspiration. It’s not an accident that there was a clothing store in mid-60s London called “I Was Lord Kitchener’s Valet.” I remember watching Nightline on June 1, 1987, twenty years after Pepper’s release, and the panel discussing the album’s social and cultural impact. That itself was thirty years ago. Look around today and I am sure you will see or hear a reference to the album the provided the soundtrack to the summer of 1967. Liverpool (above) was one of Europe’s many port cities from which Europeans flocked to the United States prior to the First World War. I noted with interest today that the city of Liverpool is to build its own immigration museum. This will not be the first museum in Europe dedicated to the mass exodus from the Old World to the New. Antwerp for one has its Red Star Line Museum, which opened in 2013. In my time volunteering at Ellis Island I always stressed that immigration to the U.S. at the turn of the last century was not a one way street and that the human drama was taking place on the other side of the Atlantic as much as it was at Ellis Island, Baltimore, Charleston, and the other port cities of the United States. Anything less is just half the story. The Liverpool immigration museum seems to be part of city’s larger strategy to emphasize its cultural heritage. Most famously city leaders plug The Beatles and Mersey’s importance to the band’s sound and rise. And why shouldn’t the city do that? ; the rough and tumble town was integral to who the group was. Hamburg, itself another port city instrumental to the Beatles development, opened its own immigration museum, the BallinStadt, in 2007. European immigration to the United States crested a hundred years earlier, 1907, but held steady until the onset of the Great War seven years later, when the sea routes were disrupted and Atlantic travel dropped off precipitately. 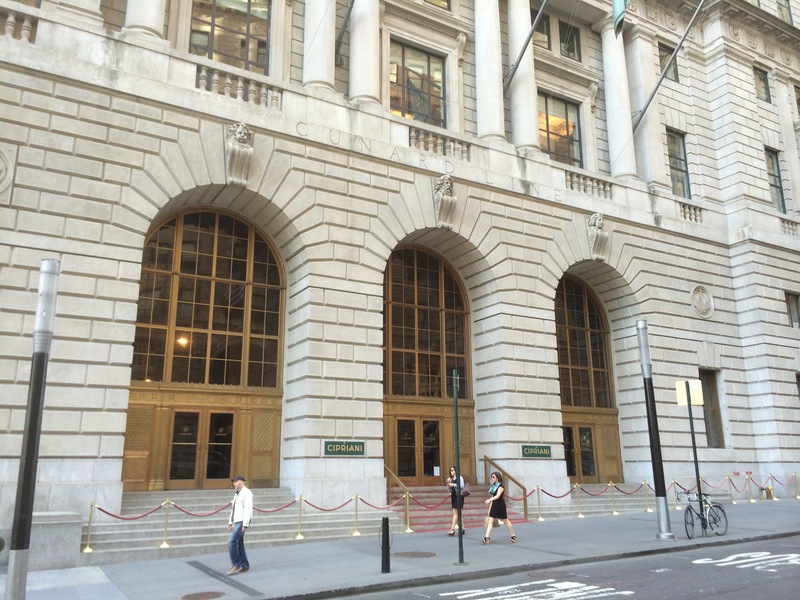 I was down on Lower Broadway the other day and took a few minutes to take these photographs of the Cunard Building. 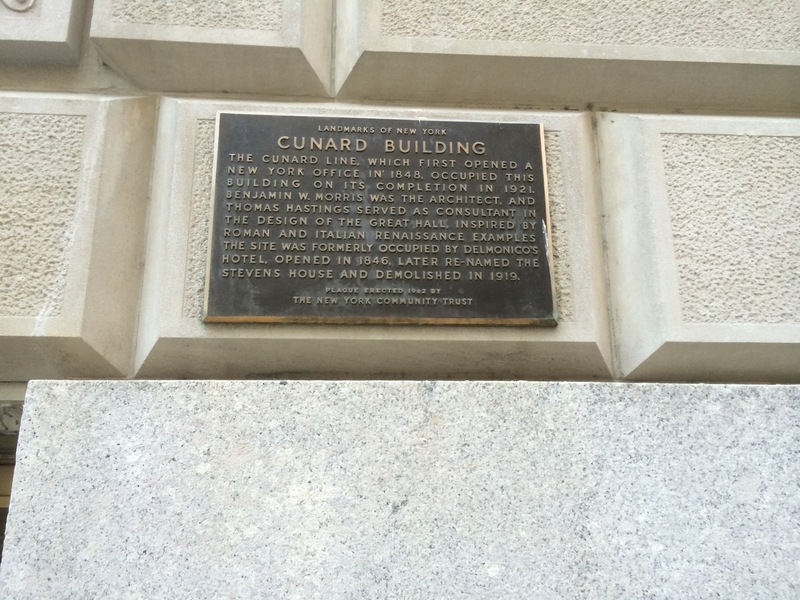 As the plaque indicates this edifice was constructed after the First World War and thus obviously after the sinking of the Lusitania. It’s strange how such events, tragic as they are, don’t prevent the world from continuing; officials announced this construction project in February 1918 while the war was still going on and very much hanging in the balance. It is important to remember how long the transatlantic passenger shipping industry existed. It lasted well into the 1950s and even early 60s until the arrival of wide-scale and economical airline passenger travel. John Lennon’s father, Alfred Lennon, was a so-called Cunard Yank, a man who saw the world working shipboard. For years he was a waiter on different ships, entertaining passengers with his humor and singing voice. When the Beatles came to America in 1964 they flew in to JFK. The rotting piers were a fixture of the NYC waterline until just 10-15 years ago when city officials and urban planners figured out how to re-purpose them. Investors purchased this site at 25 Broadway across the street from Bowling Green for $5 million in July 1919 currency and spent the same amount on the 48,000 square foot building. 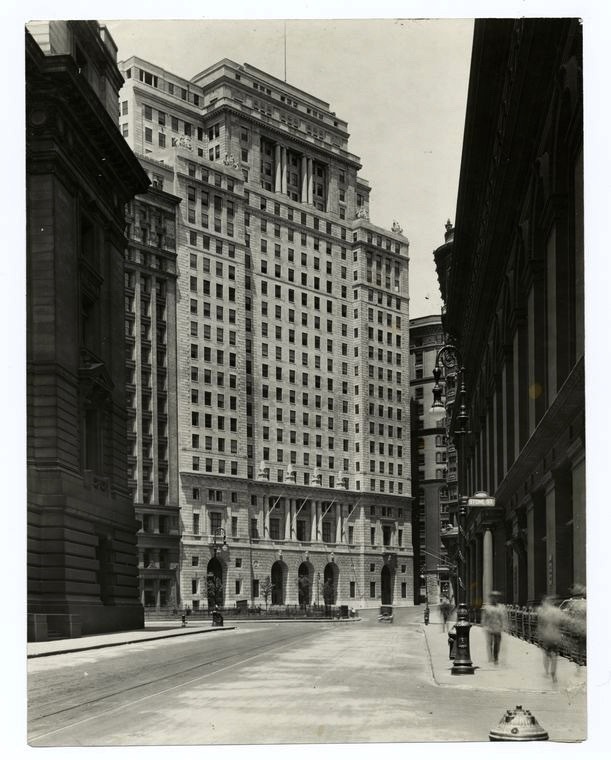 The construction went quickly; Cunard and other tenants took occupancy in July 1921. Investors purchased the building in 1962. 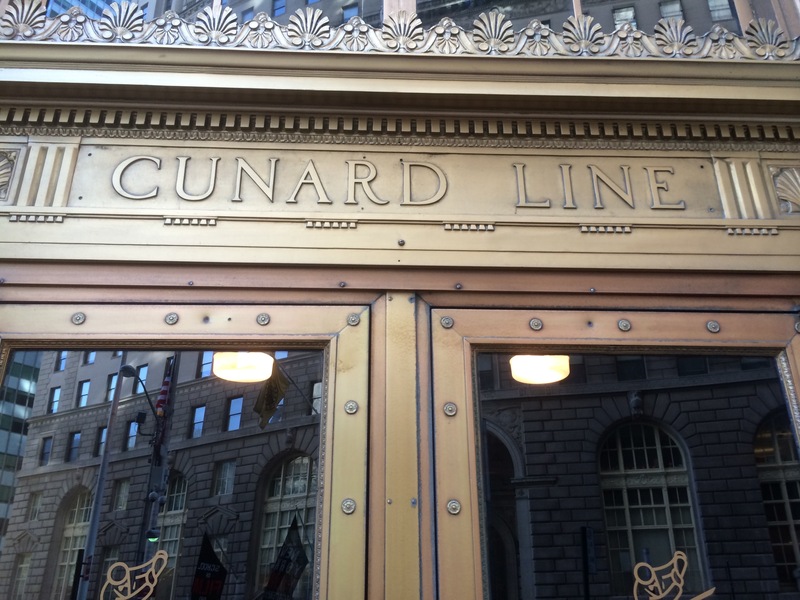 Cunard remained as a tenant for a few more years and left around 1970, not that long ago in the grand scheme of things. 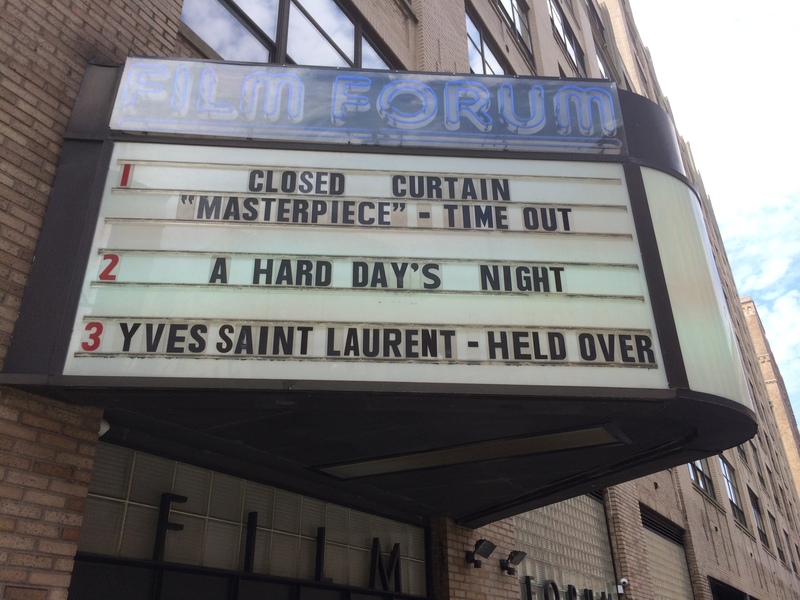 I had the day off today and, determined to do something that included air conditioning, went to see the newly remastered A Hard Day’s Night at the Film Forum. The film was originally released fifty years ago this week. I have seen the movie at least dozen times, including several on the big screen, and it never ceases to surprise. It is one of those cultural reference points that I revisit every 5-6 years and see through different eyes every time. What is on screen is the same; it is my perspective that changes as I grow older and develop. In that way I know the place for the first time. A Hard Day’s Night strikes the perfect balance of story telling, musical montage, and seeming cinéma vérité. Seeming is the key word. Five decades on some viewers still believe they are watching a documentary. This is not surprising; the Maysles Brothers’ footage of the Beatles’s February 1964 arrival in the United States was one of the A Hard Days Night’s inspirations. It is easy to confuse the two. The whole movie is leavened with just the right dollop of magic realism, which is appropriate. The Beatles at their best contained just the right dollop of magic realism. the North/South Divide. In England the caricature is flipped; Southerners are seen as being sophisticates and Northerners the rubes. This was especially true a half century ago. Unlike some scousers in show business at the time, the Beatles never hid their Liverpudlian provenance. I had never noticed the North/South jokes before today, probably because there is so much else going on. The Beatles made a few more movies after A Hard Day’s Night, but none succeeded like this one. The later efforts couldn’t capture the wit and winningness on display here. It was a time when a rock group could share a variety stage with magicians, jugglers, and dancing acrobats without a trace of self-consciousness. It all seems so far away and yet so modern at the same time. Watch it again and you will see. It is early Sunday. I am having my coffee and enjoying the quiet before heading off to Governors Island in a little bit. It is going to be a beautiful day, mid 70s and bright skies. You can feel that fall is around the corner. It will be a great day to be outside. I got a chance to see Good Ol Freda this week. I would recommend the documentary to those who like the Beatles and want to watch a film that captures the excitement of Beatlemania. Ironically, the traits that made Freda such an important part of the Beatles’s inner circle–her tact, her loyalty, and sense of discretion–are what keep the film from being better. She was, and is, so loyal, that you don’t come away with much more than you already knew. Still, because I suspected as much going in, I cannot say I was surprised or disappointed with the film. If anything, it makes me admire her that much more. It’s no wonder the Beatles trusted her so implicitly. It would have been so easy for her to air the dirty laundry, and you have to admire her for not doing so. Like the Beatles at their best, Frida Kelly appeals to your better nature. Go see it if you can. In the meantime, we will wait for Mark Lewisohn’s Tune In, which will be hitting bookstores in about six weeks. The pr machine is starting to kick into gear. I’ll let Mark Lewisohn explain. Enjoy your Sunday.